Karnataka’s third-highest peak Kudremukh (Horse face in Kannada) lies in the picturesque Chikmagalur district. The stunning peak offers a bird’s eye view of beautiful Shola forests. The Kudremukh National Park is also the origin point for three important rivers – the Nethravathi, the Bhadra and the Tunga. The latter two rivers flow freely through the rolling hills and the lands. The region is also rich in biodiversity, with animals such as the spotted deer, sloth bears, wild dogs, and Malabar civets found here. Originally developed as an iron ore mining town, the hill station township of Kudremukh was primarily set up for the Kudremukh Iron Ore Co. Ltd. which operated for almost 30 years before shutting shop due to environmental issues. 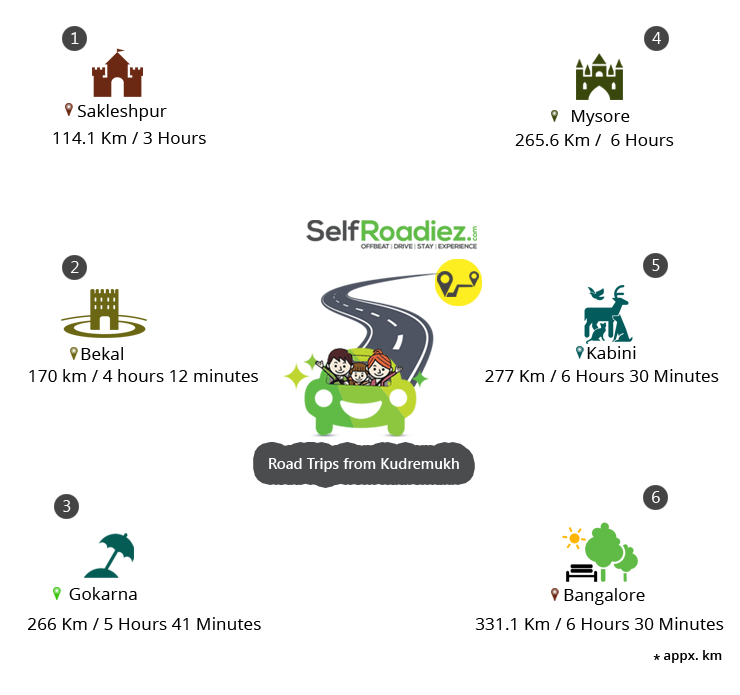 Kudremukh is also both a mountain and a peak. Kudremukh (originally Kuduremukha) literally means ‘horse-face’ in Kannada, which is what one particular picturesque side of the mountain looks like. The peak was also historically known as the ‘Samseparvata’ since its approach was from the Samse village in Mudigere taluk. 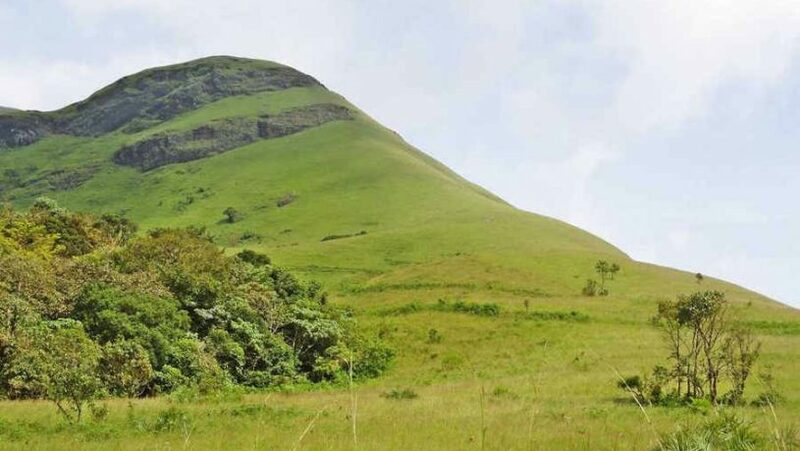 After Mullayanagiri and Baba Budangiri, Kudremukh is Karnataka’s third-highest peak, standing tall at 1,892 meters. It is located in the area now known as Kudremukh National Park, which is the Western Ghats’ second largest wildlife protected area belonging to a forest. Summers (March-June) and winters (October-March) in Kudremukh are great for exploring the sights, trekking and wildlife excursions. Monsoons (July-September) are when the surroundings are at their prettiest, green best. The best time to visit Kudremukh is between October and May. If one is also planning to do scuba diving in Murudeshwar, then November-January is a perfect time. The nearest airport is at Mangalore, 100 km away. The nearest airport is at Udupi, 85 km away. Sakleshpur is a hill station located in the Malnad region of the Western Ghats in Karnataka. The picturesque hill station derives its name from ‘Sakala-aishwarya–pura’ which literally translates to ‘the place that has been blessed with the wealth of all kind – spices, water, climate, and coffee – which is perfect since Sakleshpur sits pretty amongst acres of areca, pepper, cardamom and coffee plantations. For those looking for some cultural exploration, the Manjarabad Fort and the Kukke Subramanya and Sakleshpura temples await. For those who wish to explore the region’s natural beauty, Bisle Ghat, Jenukal Gudda viewpoint, Magajahalli waterfalls etc. are the places to be. Bekal in Kasaragod, Kerala is a beautiful, imposing coastal town housing a famous keyhole-shaped fort that is said to be Kerala’s largest and best-preserved one. Other places to see in Bekal include the scenic shorelines of Bekal beach, the Valiyaparamba backwaters, the Nityananashram Caves, Chandragiri fort, etc. Gokarna, which literally means ‘Cow’s ear’, is a scenic temple town, having recently gained the stature of also being an epicenter for adventure as well as a laid-back holiday destination. Gokarna is also known to be one of the seven important religious centers for Hindus. Travelers can indulge in beach trekking at any of Gokarna’s 5 famous beaches, visit the temples such as the Mahabaleshwar temple and even indulge in the many adrenaline-pumping water sports such as kayaking, snorkeling, and parasailing. Karnataka’s 2nd largest city Mysore is the preferred destination for cultural experiences in South India. Being the former administrative and royal seat of the Wadiyar Royal family, Mysore is history galore. Culture trippers will be enthralled by the grandiose Mysore Palace and the intricate designs of the magnificent Chamundeswari temple. Finish off your Mysore tour with an evening visit to the sprawling lush-green Brindavan Gardens, where the flora and the beautiful fountains will keep you captivated. The popular Kabini Wildlife Reserve is one of Karnataka’s most sought-after wildlife destinations. The serene Kabini flows through the reserve, as a result of which a rich variety of fauna and lush-green florae are the reserve’s highlights. Travelers can experience nature up, close and personal with kayaking, bonfires by the river, boat cruises, off-the-track cycling, camping in the great outdoors, coracle rides on the river and wildlife safaris and night trails. India’s 3rd-largest city Bangalore is a cosmopolitan hub brimming with cultural hotspots, a slew of IT hubs and green spaces. Bangalore has something for every kind of traveler Don’t miss seeing landmarks such as the Vidhana and Vikas Soudha, Seshadari Memorial, Tipu Sultan’s Palace, Bangalore Palace, ISKCON and Bull temples, Holy Trinity Church and St. Mary’s Basilica, etc. There are many places of interest to see in Kudremukh. A trek up the Kudremukh Peak is a must-do if you like trekking. Situated at an altitude of 1894 meters, the peak is a beautiful abode and a haven for naturalists. Kudremukh Natural Park is yet another place where you can enjoy nature and spot wild animals. A few other places that are worth a visit are – Hanuman Gundi Falls, Gangamoola, Kalasa, Lakya Dam, Horanadu etc. There are many resorts, homestays, holiday homes and budget hotels at Kudremukh where you could find accommodation. Since most of them are situated near viewpoints, you will find rooms with great views here. An abundance of trees, bird species, waterfalls, streams, and lush plantations make for a picturesque location. This setting makes the Homestay an ideal retreat for nature lovers. The cool weather of the place also ensures that the guests’ stay here is extremely pleasant at all times. A holiday here is a unique experience as the place truly represents the beauty of Chikkamagaluru district. Travelers should note that they aren’t supposed to wander within the confines of the national park without a guide or a local accompanying them, and the forest authorities have the authority to detain them. Also, littering is prohibited and anyone doing so can be penalized heavily. Kudremukh is the perfect place to have a naturally adventurous holiday in the lap of nature.